What does a node represent on a phylogenetic tree? Nodes specifically indicate the most recent common ancestor between the two branches. For example, the ancestor found at the node joining branches from humans to branches from dogs would represent the most recent link between the two branches. Convergent evolution describes the independent evolution of traits at different points on a phylogeny, and is not related to nodes. Kingdoms and domains are very broad categories. They can be represented by nodes, but only at a very global level. What are the two classification groups that are representative of the scientific name for an organism? Genus and species are the two taxonomic classifications that are used to represent the scientific name of an organism. The hierarchy of the binomial classification system is (from the top tier to the bottom): kingdom, phylum, class, order, family, genus, species. Kingdom gives the broadest classification of an organism, while species gives the most specific. The most specific classifications are used to name the organism. For example, the scientific name for a house cat is felis catus. This indicates that houses cats, like some other species, are in the genus felis and have the unique species tag catus. The full classification for a house cat would be: anamalia (kingdom), chordata (phylum), mammalia (class), carnivora (order), felidae (family), felis (genus), catus (species). According to the character table above, which of the following would define a clade? A clade is defined by a organisms that possess a shared derived trait. In other words, we need to find a set of organisms in the table that includes all organisms with a certain listed trait, while excluding any that lack that specific trait. The lion, fish, and sea urchin are the only clade listed. They are all triploblastic, segmented deuterostomes, and none of the other species share those characteristics. The trait of being a deuterostome is the shared derived trait that defines this clade. Sea urchin, jellyfish: The jellyfish is the outgroup of the tree presented in the table, as it does not have any of the listed traits. Its last common ancestor with the sea urchin is also its last common ancestor with all of the other species, so a clade with the jellyfish must include all 5 species in the table. Fish, sea urchin, scorpion: All share segmentation and three tissue layers, which the jellyfish does not have. However, the lion also has segmentation and three tissue layers, so it must be included to form a clade. Fish, sea urchin: Both are deuterostomes with segmentation and three tissue layers, but the lion is also a deuterostome, so it must be part of the clade. Scorpion, sea urchin: They both have segmentation and three tissue layers, but so do the lion and the fish, so they must also be part of the clade. Cladograms show evolutionary relatedness, usually based on the similarity of the DNA sequences between different species. The closer two branches of the cladogram are to each other, the more closely related the organisms are to each other. The ends of the branches indicate a common ancestor shared by all of the species of that branch. Cladograms do not show geographic relationships. Although primitive cladograms were formulated based on physical characteristics of animals, now, DNA analysis provides a much more accurate comparison between species. Furthermore, cladograms are not limited to animals. From the diagram above, to which species is species C most closely related? 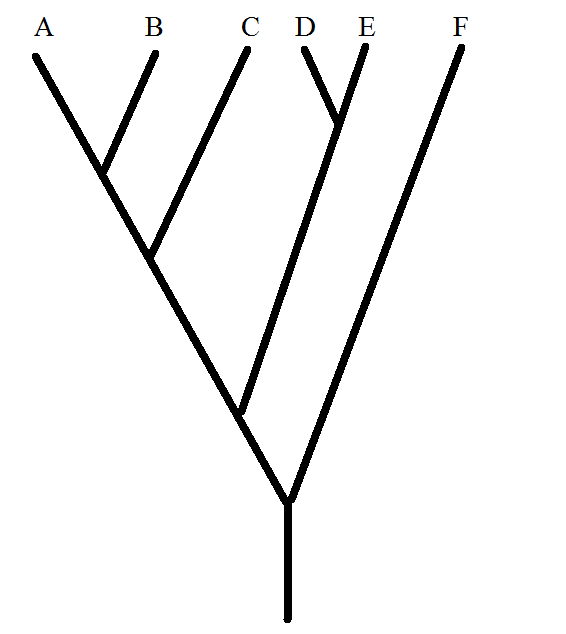 Each branch in the tree represents a break from the common ancestor at the bottom. A and B are both branches off of the same larger branch that C is also a branch of. D, E and F branched off from the common ancestor earlier than A, B, or C. In general, branches that are closer together, and are on the same larger branch, represent organisms which are closely related.